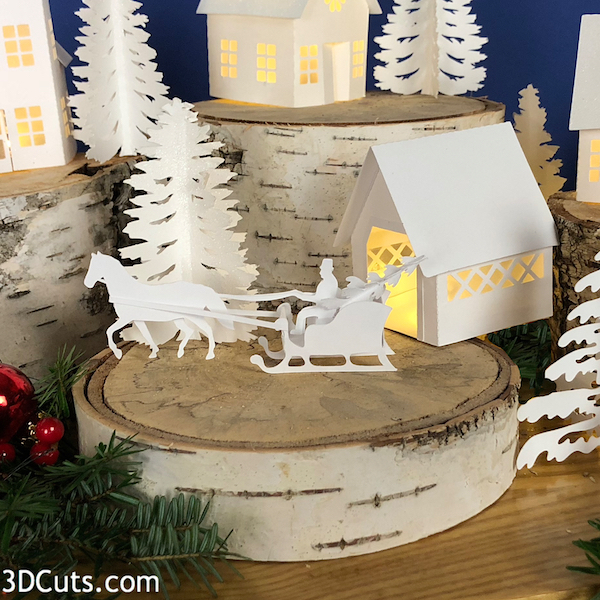 This tutorial is for the Covered Bridge and horse drawn Sleigh both which were added to the collection in 2018. 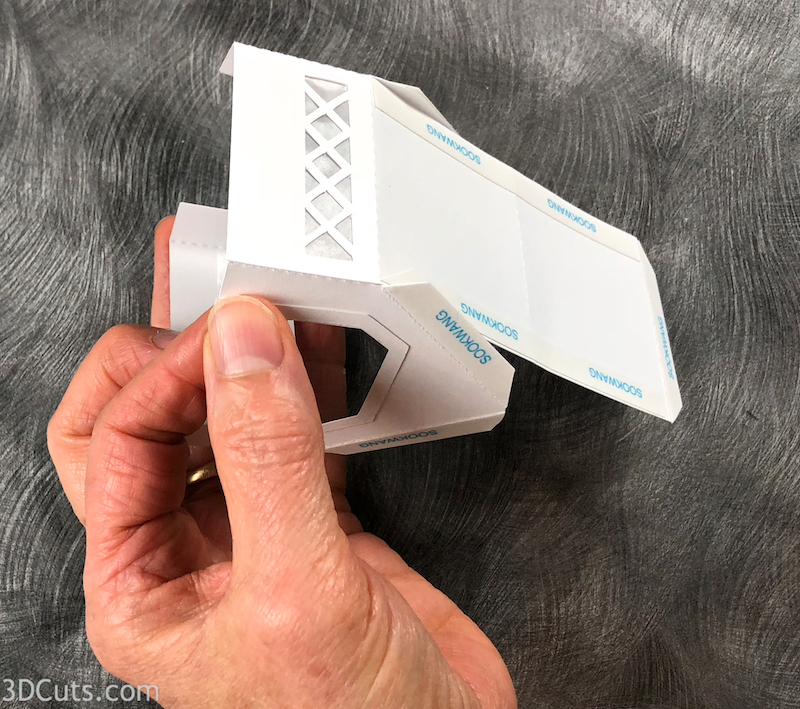 The cutting file is here. There is also adding a base system for tea light village so they can be adapted to string fairy lights. Go here for more information. 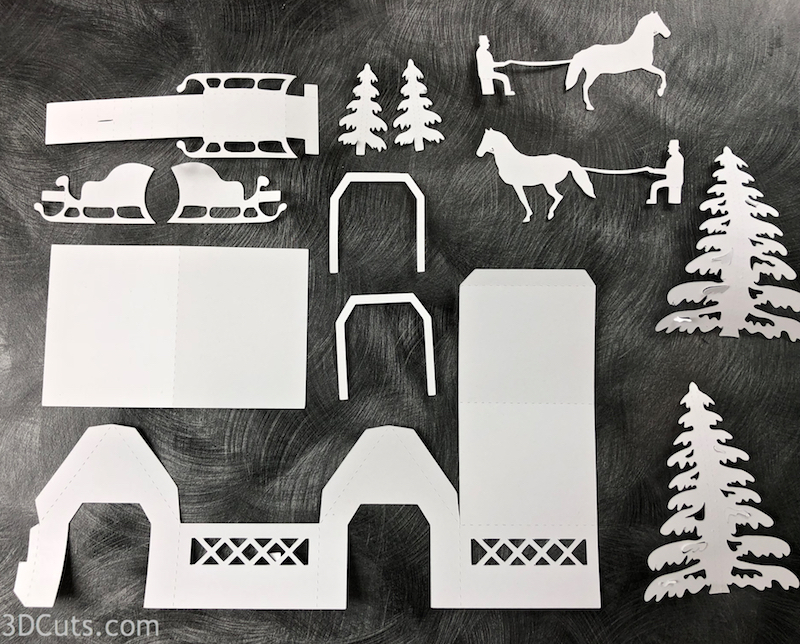 This specific tutorial is for the assembly of Covered Bridge and Sleigh. 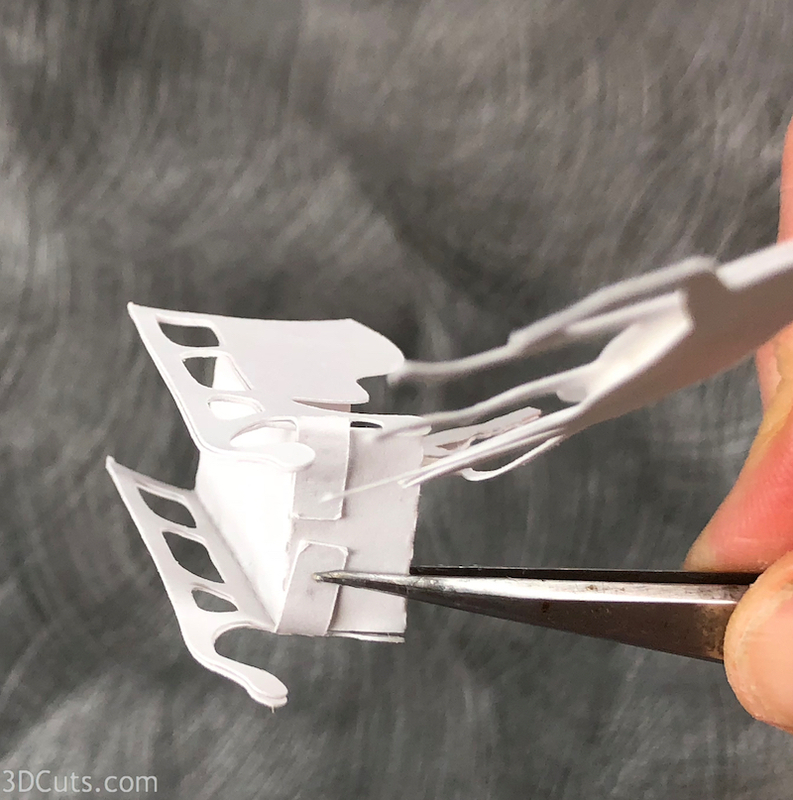 Cutting Files - Available at http://3dcuts.com/tea-light-village. 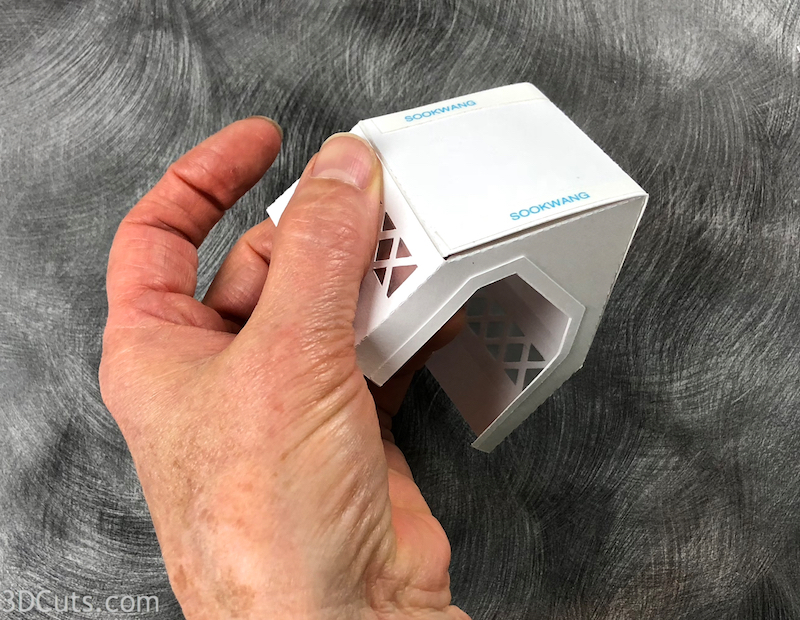 Below is a You Tube Video of the assembly process for this project. 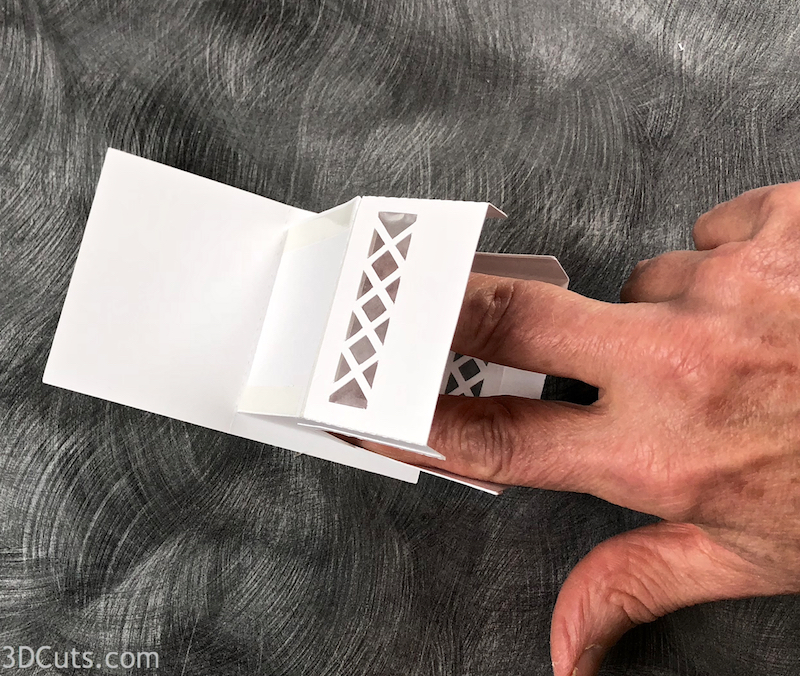 Further down on the page are photos and step-by-step assembly instructions. Because the openings are so large on the covered bridge I added a trim piece. It gets adhered to the outside of each opening. 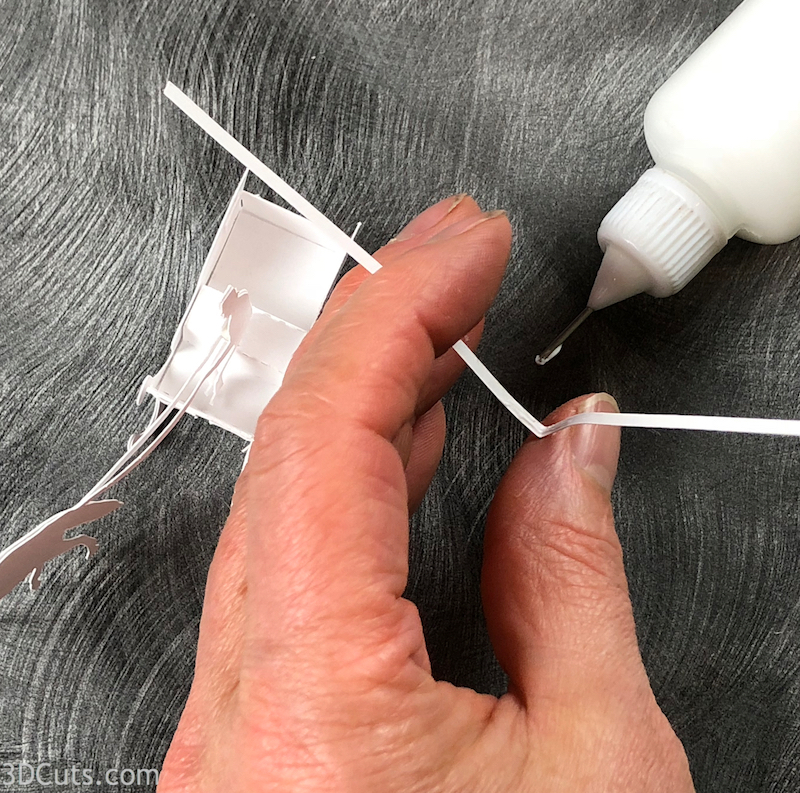 Apply a thin line of glue (I use Art Glitter Glue in a small applicator bottle). Adhere the trim to each end. 8. Apply Scor-Tape to all tabs. Leave the backing on. For easiest assembly, peel each backing as directed. 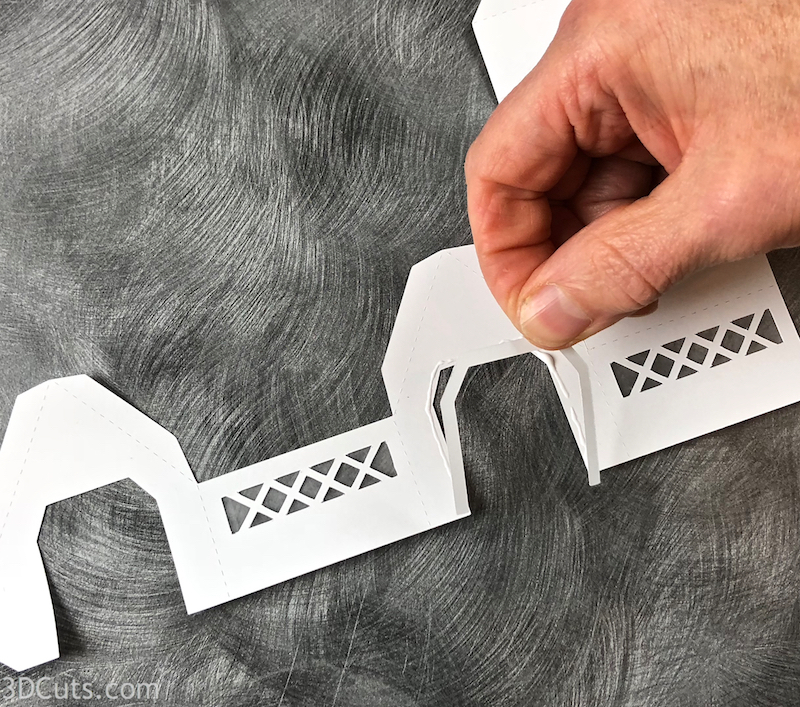 Start by peeling the backing from the strip by on the end to connect the ends and make the building base square. Adhere the two ends of the building base together keeping things straight and square. Next peel the roof angles on the roof - start with the two eve edges closest to the roof, peel, and press into place. Press all seams well to adhere. The basic covered bridge is complete- if you will be putting it over a tea light. But if you are using fairy string lights or are going to position over a gap for a river you might want to add the optional floor. 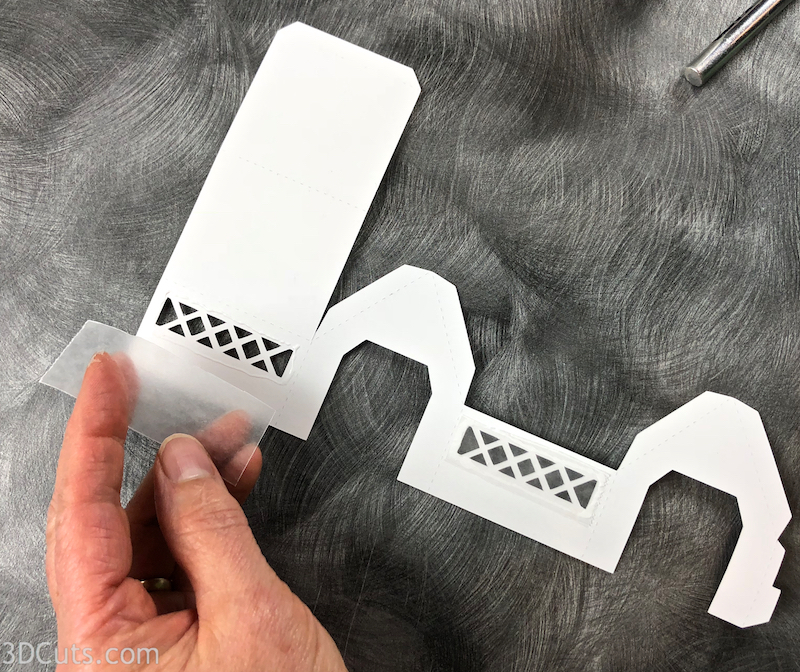 Fold down both tabs on the floor piece. Apply score tape to both tabs. Slide into bottom with tabs facing in toward the inside of the building and press in place. Collect the parts for the sleigh. 2. Combine horses and man. Cut 2 1/4” foam dots in half. Place 2 halves near the bell of the horse on the indie on one piece. Place 1 1/2 tab just inside of the arm on the man’s belly as well. This will give them some dimension. 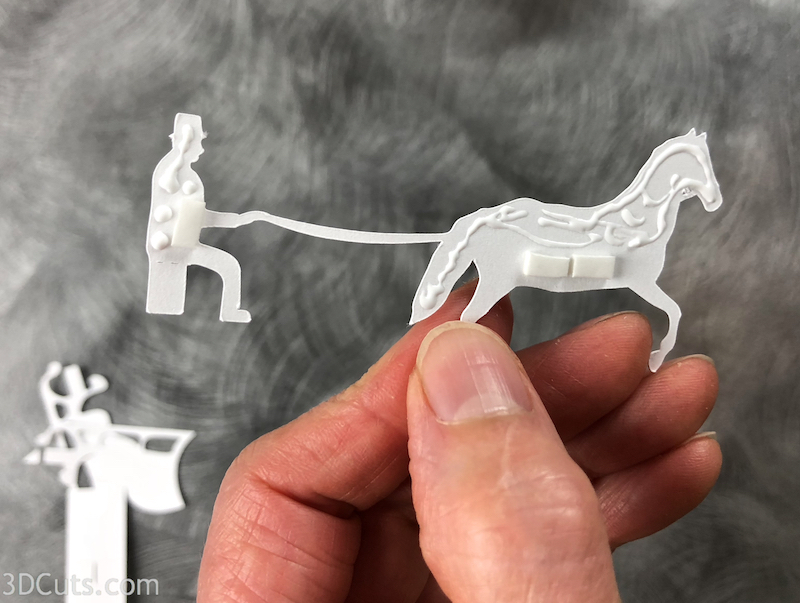 Add a small amount of glue to the tail, back and head of horse and to the head and back of man. Do not put glue on the legs of the horse or the legs, arms or bottom tabs of the man. Attach the second horse/man piece to the first. Start by matching the horse heads, backs and tails. Then match the mans head and back. There should be spaces between the legs and arms. 2. 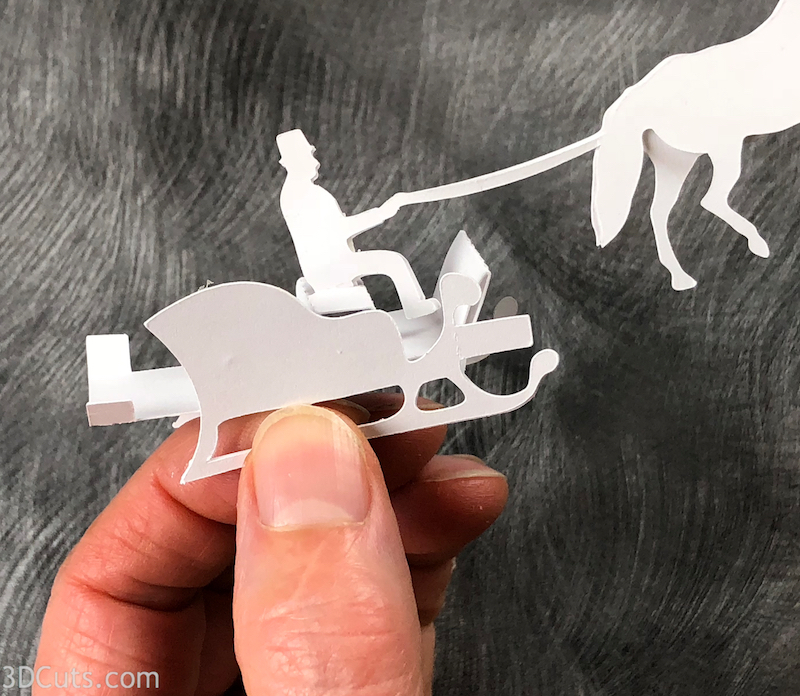 Make the sleigh and attach to horse. 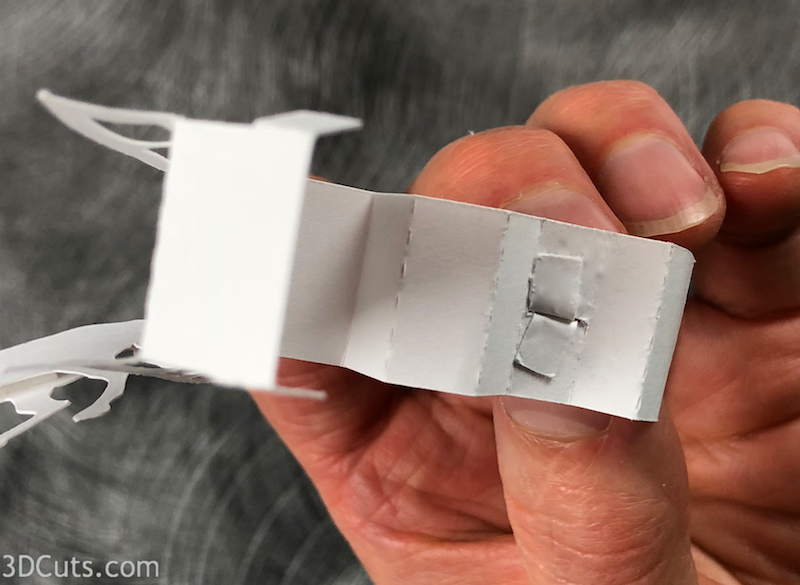 Fold the sleigh front and back as shown. Fold all the sleigh portions to match the photo. 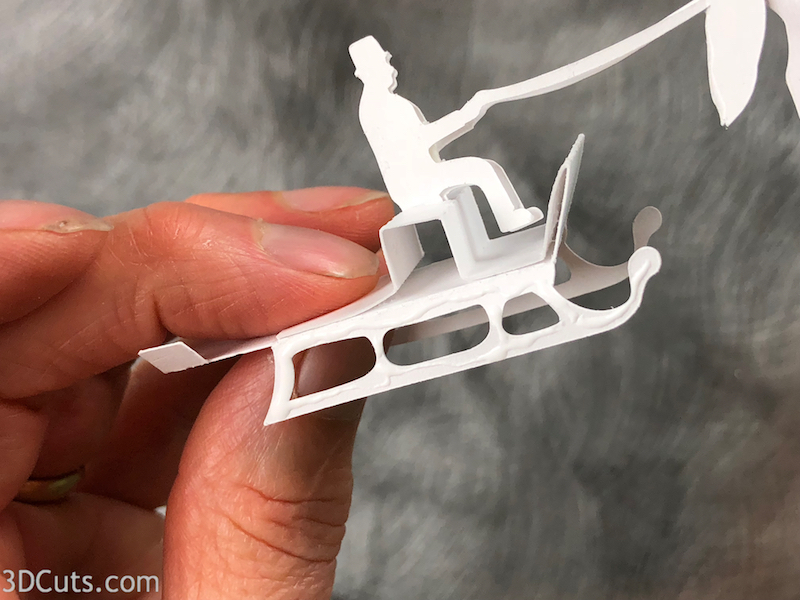 The tabs below the man will be slide into the slot on the bench portion of the sleigh. Refer to the photo. Spread the two tabs on the underside of the bench and glue in place. This image shows how the driver will be positioned sitting on the bench before it is glued in place. Apply glue to the 3 tabs pictured to the right. Do not put glue in the other areas. I used the Art Glitter glue with a fine tip. Starting at the sleigh end, the first section folds back on itself to form the front of the sleigh. The second section is attached now to the first. 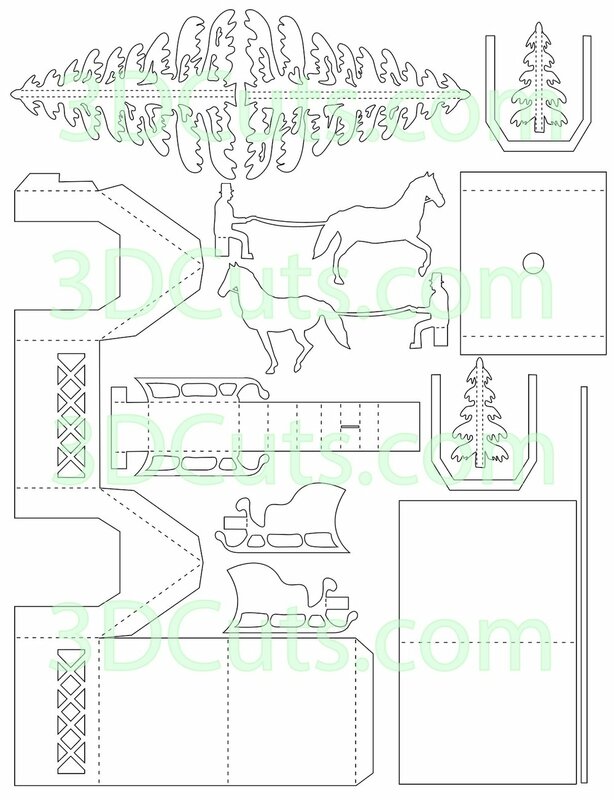 The 3rd section gets glued to the floor of the sleigh right behind the front. Sections 4-5-6 have no glue and make the bench which shapes upward. Section 7 aligns with the fold line for the back of the sleigh and is the back floor. 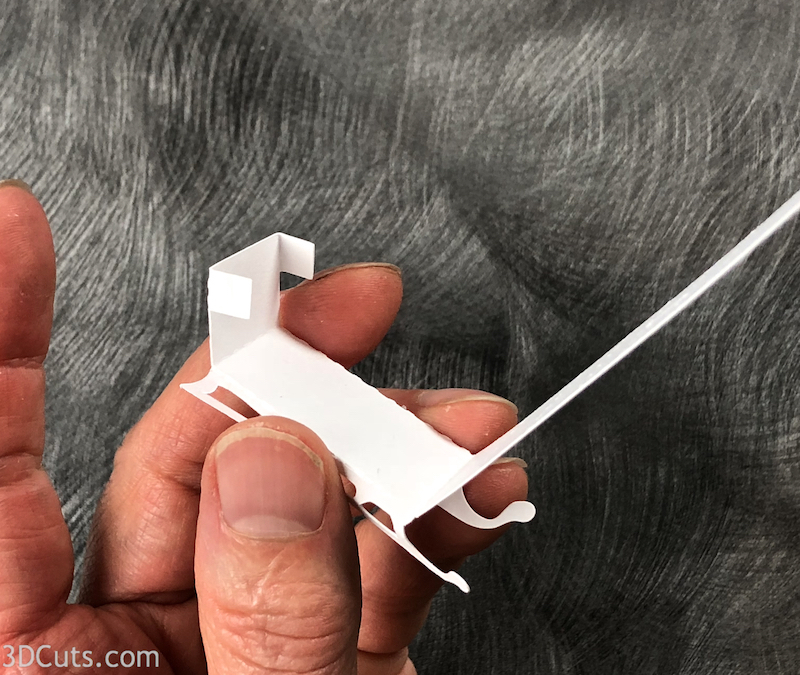 Put a thin line of adhesive on one of the side runners of the sleigh. Apply the side over it aligning the runners. 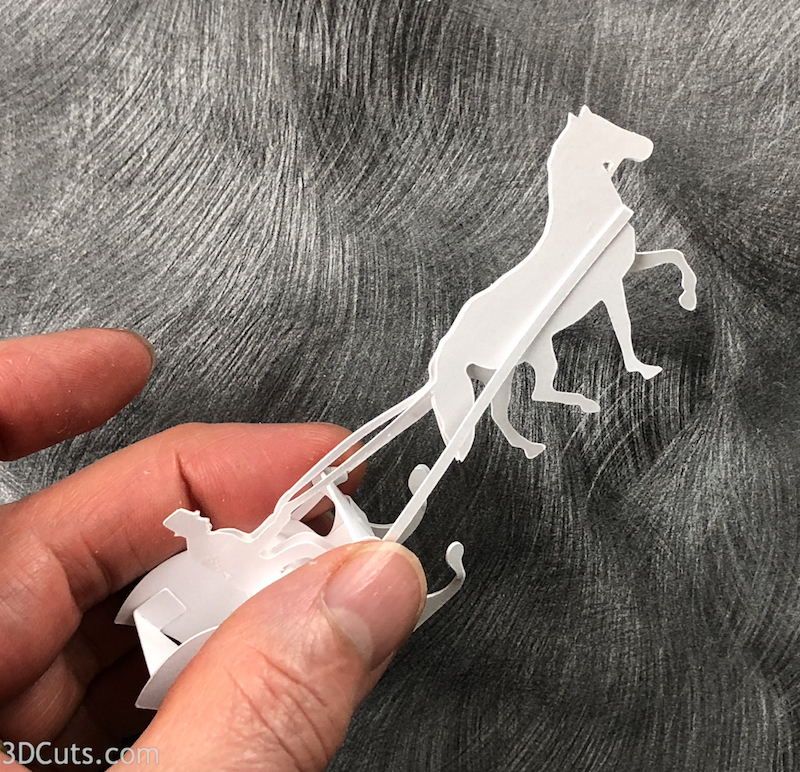 Put a dab of glue on each of the tabs on the sleigh back. Fold to the inside of the sleigh walls and adhere in place. The front tabs get folded and adhered to the outside of the front of the sleigh. Apply glue to the center inch of the long skinny piece. 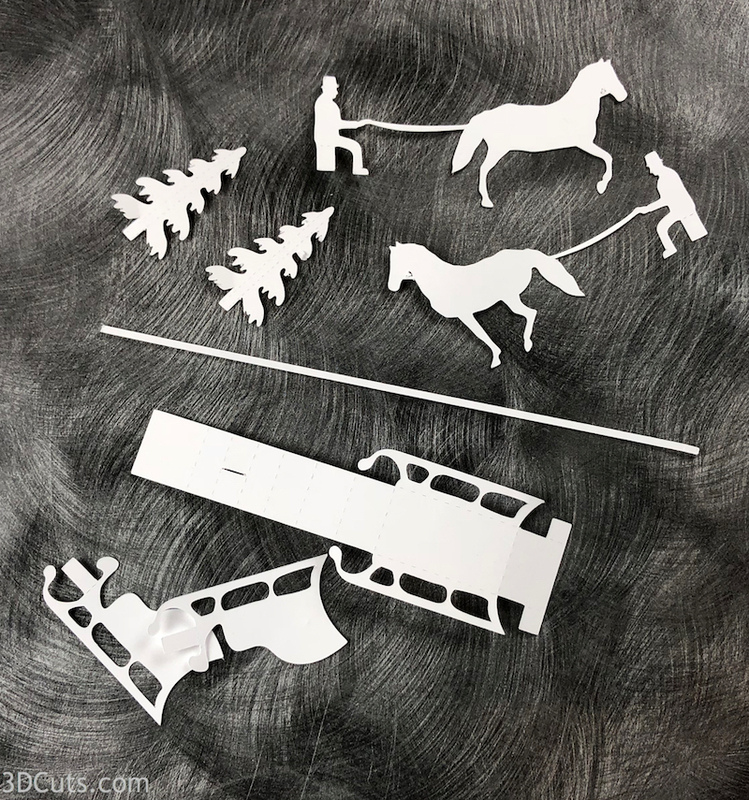 Adhere this to the chest of the horse with the sides extended back to be glued to the sides of the sleigh. Adhere these to the sides of the sleigh near the front. Look from the top and make sure everything is centered before you press into place. Snip off the extra length of the harness. You may need to spread the horses legs a little to help it stand. 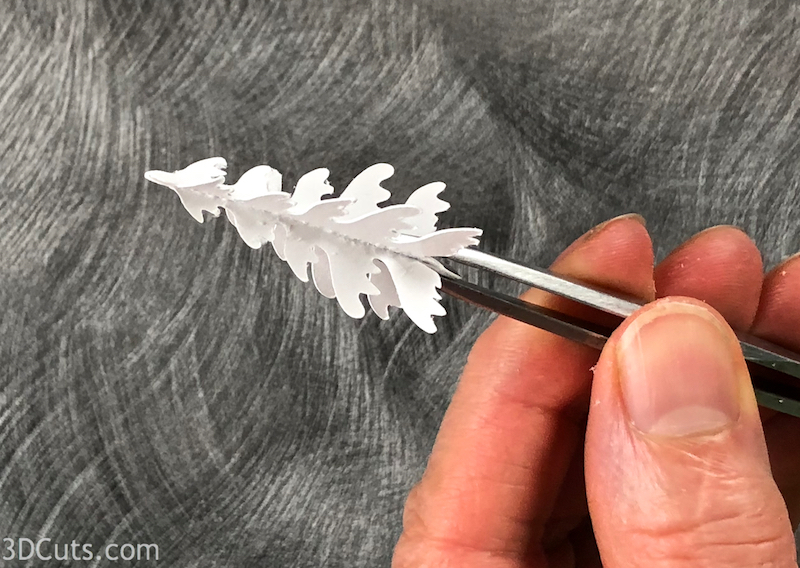 Fold the tiny trees on the fold lines and glue down the center. The tiny tree goes into the back of the sleigh. Your covered bridge and sleigh are complete. What is next?